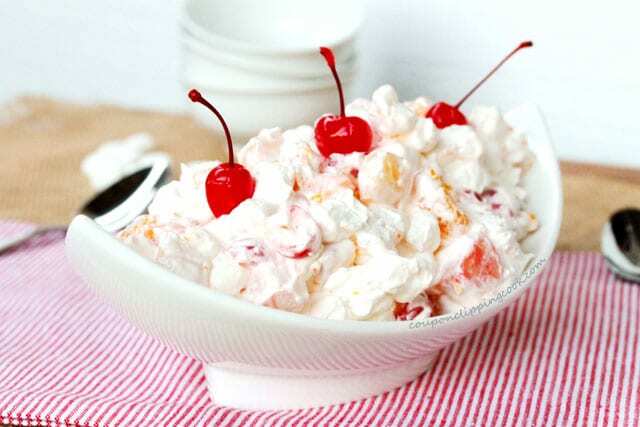 This ambrosia tastes as good as it looks and is sure to be a crowd-pleaser with people coming back for seconds and even thirds. One of the fun things I like about being a grown up is doing things my own way. 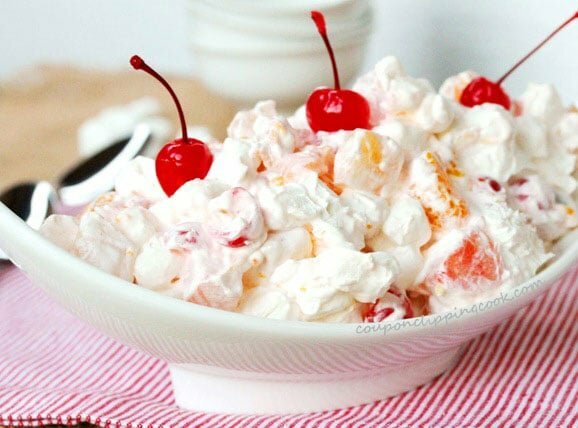 When I was a kid we always had ambrosia with our holiday meals. 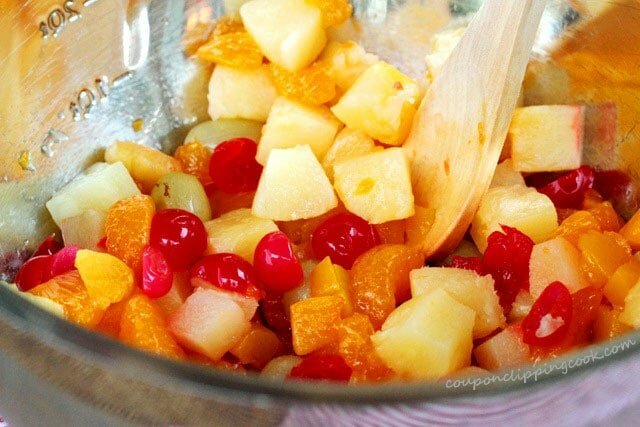 I’d pick thru my serving to find the little treasures like the cherries, mandarin oranges, and pieces of pineapple. But they were far and few between. So now that I’m a grown up, I load up my ambrosia with my favorites (cherries, mandarin oranges, and pineapple chunks). And because I don’t want to break too much tradition I add a can of fruit cocktail for good measure….but I just can’t help myself from using the triple cherry kind. My biggest pet peeve when I’m making ambrosia is when the fruit isn’t thoroughly drained. It makes the marshmallows soggy and the Cool Whip gets kind of runny. So the very first thing I do in the morning when I start cooking for Thanksgiving is to drain the cans of fruit, and then put the fruit in a strainer for as long as possible (about 4 hours). Then the ambrosia turns out super light and fluffy. 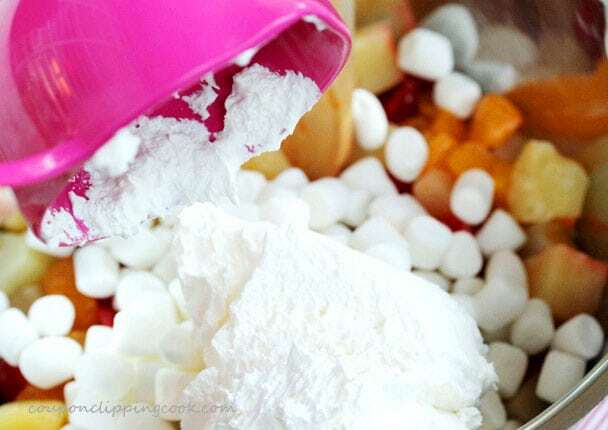 This ambrosia is super quick to make and is best when the marshmallows and Cool Whip is mixed in just before serving. 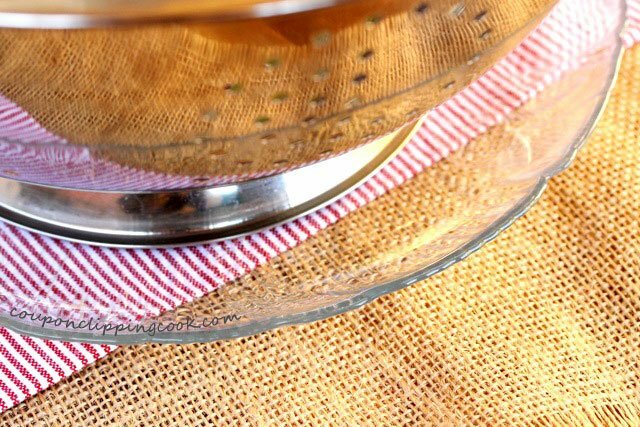 Set a large strainer on top of a plate or large flat bowl and set aside for a moment. 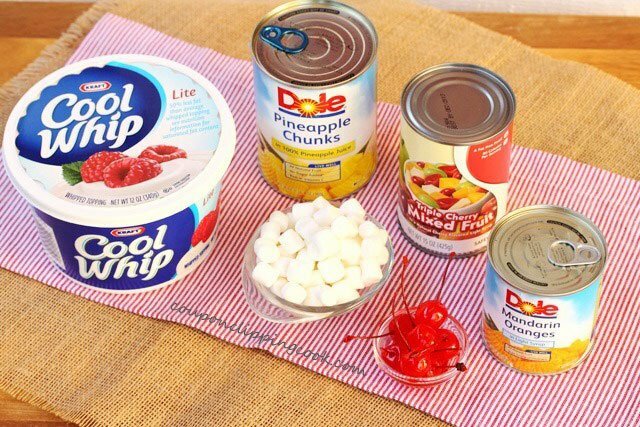 Drain out the juice from the cans of fruit. mandarin oranges to the strainer. Cut the cherries in half and add them to the strainer. 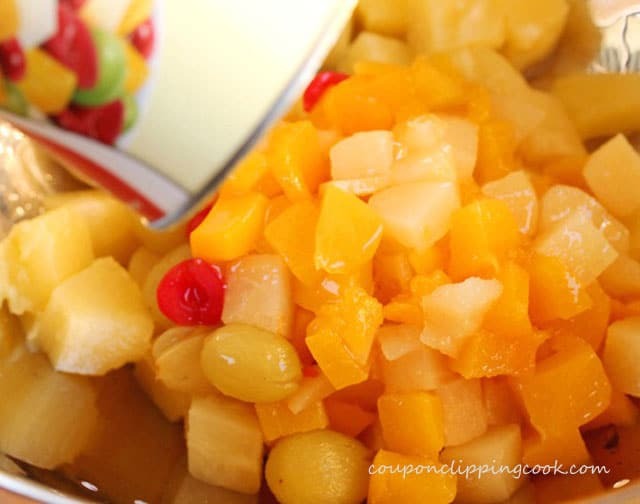 Using a spoon, spread the fruit out in the strainer so it’s not lumped together. Let the fruit sit in the strainer for 2 to 3 hours (or more) if you have time, so that all of the juice is drained from the fruit. Transfer the fruit to a large bowl. gently blend in the Cool Whip. Serve chilled. Garnish with maraschino cherries (with stems). This ambrosia tastes as good as it looks and is sure to be a crowd-pleaser with people coming back for seconds and even thirds! Set a large strainer on top of a plate or large flat bowl. Set aside for just a moment. 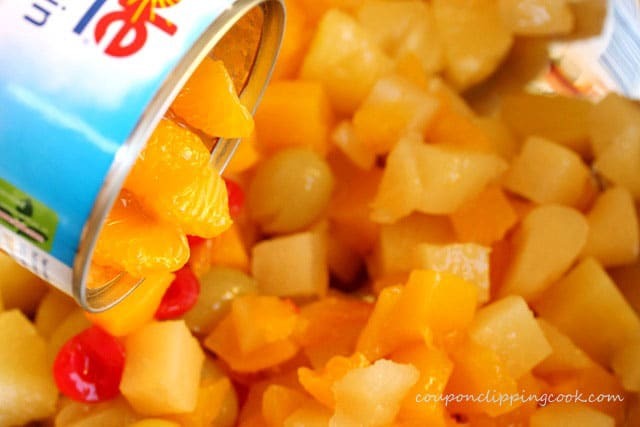 Drain out the juice from the cans of fruit. 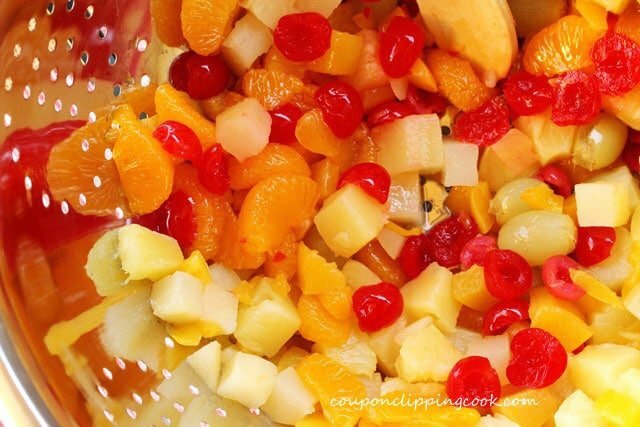 Add the pineapple, fruit cocktail, and mandarin oranges to the strainer. Cut the cherries in half and add them to the strainer. 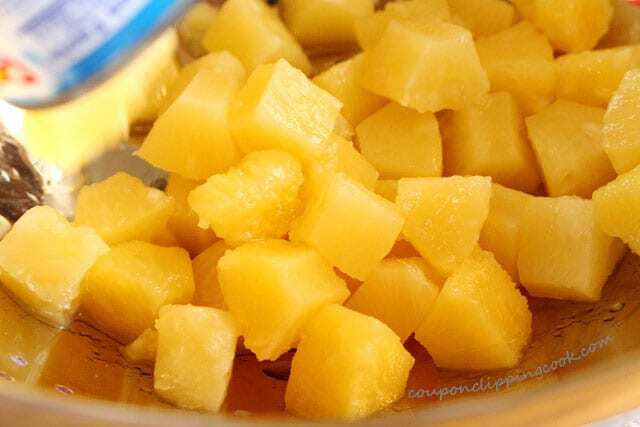 Using a spoon, spread the fruit out in the strainer so it’s not lumped together. Let the fruit sit in the strainer for 2 to 3 hours (or more) if you have time, so that all of the juice is completely drained from the fruit. 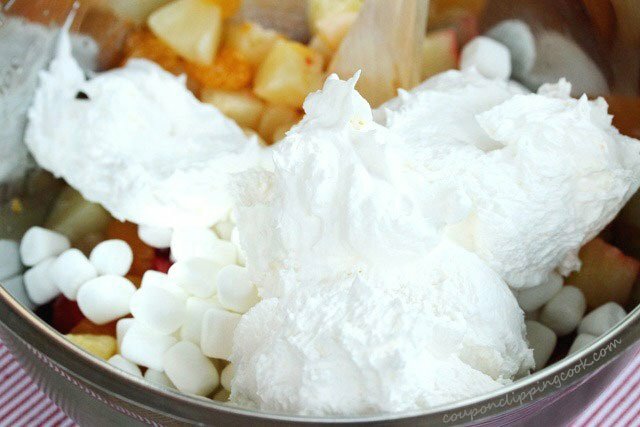 Transfer the fruit to a large bowl and add the marshmallows, and Cool Whip. Gently blend in the Cool Whip. Garnish with maraschino cherries with stems. Serve chilled. We are a participant in the Amazon Services LLC Associates Program, an affiliate advertising program designed to provide a means for us to earn fees by linking to Amazon.com and affiliated sites. In addition I may earn a commission for purchases made via my Amazon Influencer page. I make the same thing but instead of draining all the fruits for such a long time, I add an envelope of cherry jello and refrigerate for at least an hour. Sets up lovely. Not quite a firm as jello but nice for serving. 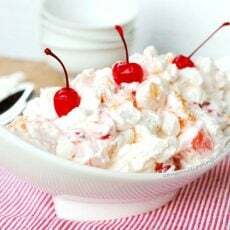 Kids love it with chopped nuts (pecans or walnuts) or and you can add a package (regular size) of whipped cream cheese. (Still add with Jello) If you do it that way, don’t drain or barely drain your fruits at all and freeze! Slice and serve. Hi Glenda, love that way of making it. I’m going to for sure try it. It sounds delicious. Thank you so much for your comment! Hi Allison, so glad you like this. Depending on how much other food there might be I think it would be safe to estimate 5 servings for this recipe. I think multiplying the recipe by 5 should be fine especially because you’ll likely be having other goodies for your guests. Last Thanksgiving when I made this about half of my guests went back for a little more of this salad so I hope your guests will like it too. Let me know how it works out. Thank you so much for stopping by! Hi Caryn, LOVE your changes! Sounds so good. I’m going to try making it this way too. Thank you for letting me know and so glad you liked it! Hi There, I’m so glad you liked it! Your idea of substituting the marshmallows with nuts and dried cranberries sounds really good. That’s a good sign when your family asks you to make it again! That’s funny what your aunt said…maybe birthday candles will be able to stand straight up to be lighted in this salad. Thank you for letting me now how it turned out! I use this same recipe but I add alittle touch of my own…Coconut flakes….makes it all the better. Hi Beth, love it! Great idea to use coconut flakes. Such a nice accent flavor and texture to the other ingredients. Thank you for letting me know. I’m going to use it in the recipe next time I make it. Have a great week! My family has been making this for 50 years or more and we have always used sour cream to cut the sweetness. Some toasted chopped pecans are nice for a change too! I’m with you on draining the fruit. I set mine over a bowl in a colander in the fridge starting the night before I need to use the fruit!! YUMM!! I’m going to try this with sour cream next time along with the pecans. And what a great idea to drain the fruit the night before. I’m going to do that this Thanksgiving when I make this again. Thank you for mentioning this and for stopping by! so i made this for his birthday and everyone loved it they kept asking for the recipes so i told them i found it on pinterest, and when they look for it, it will lead back to your page… Thank you so much for all your advice..
Hi Lynn, so glad everyone liked it! Thank you for letting your guests know where to find the recipe and for letting me know how it turned out. Have a nice rest of the weekend! Thanks for you help.. birthday party is this weekend… i will tell you how it turns out & if the guest like it.. 🙂 also do you think i could make it the night before? Hi Lynn, for best results, the night before I would drain all of the cans of fruit real good and cut the cherries. Then put the drained fruit in a container to store in the fridge overnight but put the cut cherries in a separate container (overnight) because they tend to stain the other fruit a red color. Then the next morning if you see any fruit juice at the bottom of your container drain it out if you can. 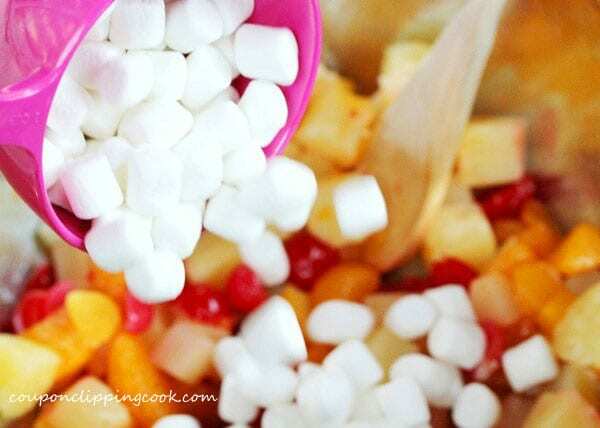 Then if the timing works out for you, about a couple hours before your guests come mix in the fruit, cherries, marshmallows and cool whip together…then store in the fridge if you have room. If the cool whip is added too far in advance it tends to get more thin. 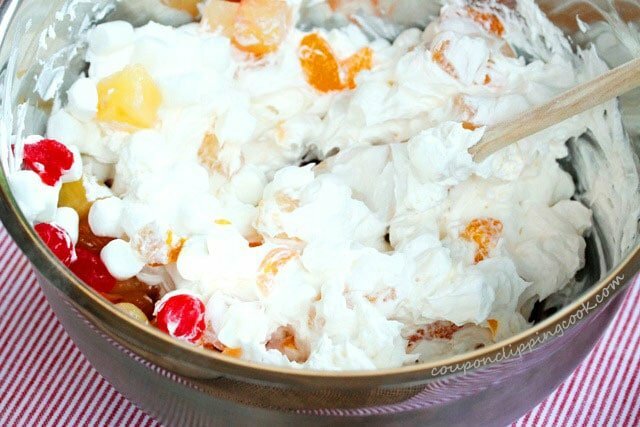 The salad looks most appetizing I think when the cool whip looks super fluffy. Okay, sorry to write a novel for your question. I hope your guests like it. Have a super wonderful time! your recipe look so good, i have been looking for the right recipe to make for my sons 6th birthday party.. but we have really big party’s with a least 40 to 50 people.. how can i change this recipe to accommodate that many people? Hi Pam, so glad you liked it! And what a great idea for a pot luck too. And love the idea of chopped pecans. I’m going to add them next time I make it. Thank you for letting me know and have a great weekend!